As an artist, people expect your creativity to be on at all times when in truth, many artists struggle with the development of their artistic identity and inspiration . It isn’t always an easy path with Google maps guiding you each step of the ways, their are road blocks and stop lights. When I need a boost in creative juices or a simple reminder of why I am doing this in the first place, I turn to a few of my favourite books. Written by the amazing artist and curator from British Columbia, Danielle Krysa, this books sole purpose is to help you get unstuck. Through a series of interviews, Danielle unpacks how other artists beat the creative block blues. She also offers exercises and tips to push you forward in times of artist need. This is an amazing resource to help spark the fire that you need to carry out a creative project. This is the newest book by Danielle Krysa, and boy does she know how to hit home with practicing artists and creative minds. This book contains 10 chapters of pure and honest truths about being and artist and the struggle with your inner critic. We know that in most situations of live, we are always our worst critic. With each chapter you will develop more and more confidence to tell your inner critic to STFU. This particular read is intended to create a continuum of creative thinking. So often, we are are afraid to pursue ideas because we think it may not be good enough but the exercise alone of seeing the idea through helps you get to the next step and next level within the idea itself. Every idea is a good idea seeks to break down these mental barriers by discussing many different creative categories and what leaders in those fields do to master their craft. Tom Sturges offers exercises to practice in daily brainstorms and everyday situations. 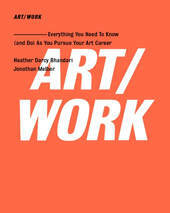 Body of Work is not an artist guide or inspiration resource, however, it is a book that will help you understand how each element of your career, whether it be volunteering or creative contracts, connect to the greater scheme of your body of work. This book will allow you to constantly re-evaluate your goals and reinvent yourself, while maintaining a portfolio that is true to your greater body of work. If you're looking for more practical knowledge of how to operate a business within the art industry, this is the book for you. Sometimes it is our lack of understanding of how to facilitate the business end of our art careers that takes away from the motivation to continue pursuing them. This book will ensure you have A-Z knowledge to tackle any situation and won't miss a beat.